As part of activities marking the 25th Anniversary Celebration of the Federal University of Agriculture, Abeokuta (FUNAAB), the Institute of Food Security, Environmental Resources and Agricultural Research (IFSERAR) will hold an agric fair with the theme: “Agriculture and the Future of Nigeria”. 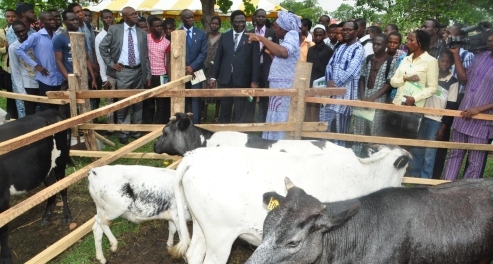 In a release dated February 18, 2013 and signed by the Director, IFSERAR, Professor Olusegun Osiniwo stated that the fair will hold between March 25 and 28, 2013 to showcase the University’s contributions to the Agricultural Sector in Nigeria. It also stated that a Symposium along the theme is also planned to be held concurrently and a large part of the fair will be devoted to other major stakeholders in the Agricultural sector including Multinational Companies, Farmers’ Organizations, Equipment Fabricators, Agricultural Seed Companies, Agricultural Finance Institutions, International Development Agencies and MDAs. Participation by the University Community is free. Interested exhibitors should pre-register with the Director, IFSERAR, by calling or sending text message to 08033187110, 08126850890 or 08104427806. Visit www.funaab,edu.ng/ifserar for more information.